What first comes to mind when you hear the words, “pop up?” Do you picture ads that you want to block from your computer? Or the music duo of the same name? Well, if you’re familiar with urban design, you probably think of a pop-up as a temporary event or place that’s established to create a sense of activity and community in an urban environment. Although pop-up retail and events have been around for decades, they’ve become especially popular in the past ten years as cities have sought lower risk, lower cost ways to experiment with different means of bringing unique retail and social experiences to their streets. In September 2014, the Rosslyn BID and The JBG Companies completed development of the Plaza on 19th at the corner of 19th and N. Moore Sts. The former site of a gas station, the Plaza was, for a time, a vacant concrete lot with few signs of life (picture at left). 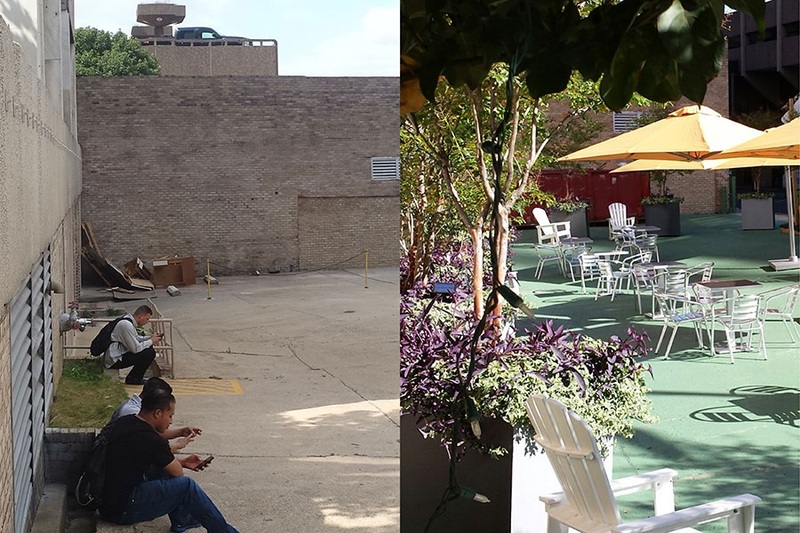 The BID and JBG made simple improvements (pictured at right): They painted the concrete green; added tables, chairs, umbrellas and potted plants; and commissioned a mural by NYC street artist Jason Woodside. These efforts transformed the lot into a usable space. People ate lunch there, drank coffee, read the news, waited for buses, hung out. And the Rosslyn BID made the most of it, too, hosting innumerable pop-up events at the Plaza during its nearly three-year existence: evening beer gardens, lunchtime celebrations, live musical performances and more. It became a favorite gathering spot while Central Place Plaza, now the site of many neighborhood events, was still under construction. Later this month, Continental Beer Garden will open permanently in the Plaza on 19th space, formalizing the Plaza's transformation from temporary to permanent use. “The JBG Companies was thrilled to partner with the BID to bring Plaza on 19th to life," says Matt Ginivan, senior vice president, development, for JBG. "It was just one of the ways we, as a long-term owner and investor in Rosslyn, benefit from having the support of a BID. We were very happy to see the Plaza being enjoyed by so many and now to see the permanent expansion of retail on that corner." 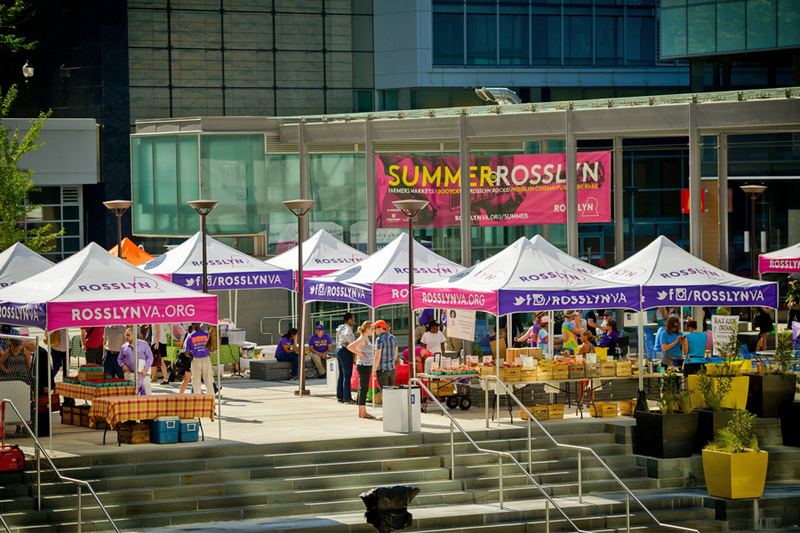 The FRESHFARM Rosslyn Farmers Market opened in the spring of 2017 at the new Central Place Plaza in downtown Rosslyn. Each Wednesday evening, workers and residents can drop by the Plaza to shop for fresh local produce and baked goods. Directly across from the Rosslyn Metro, the market is conveniently located. It offers a pleasant experience and brings more grocery shopping to Rosslyn while a new permanent supermarket is in the works. The two-day Rosslyn Holiday Market is held in Gateway Park, Arlington's largest urban park and the site of many other neighborhood events, including the Rosslyn Jazz Fest and Rosslyn Cinema + Pub in the Park. During the market, the park accommodates dozens of vendor booths, live performers, and a wonderful bonfire on Friday night. 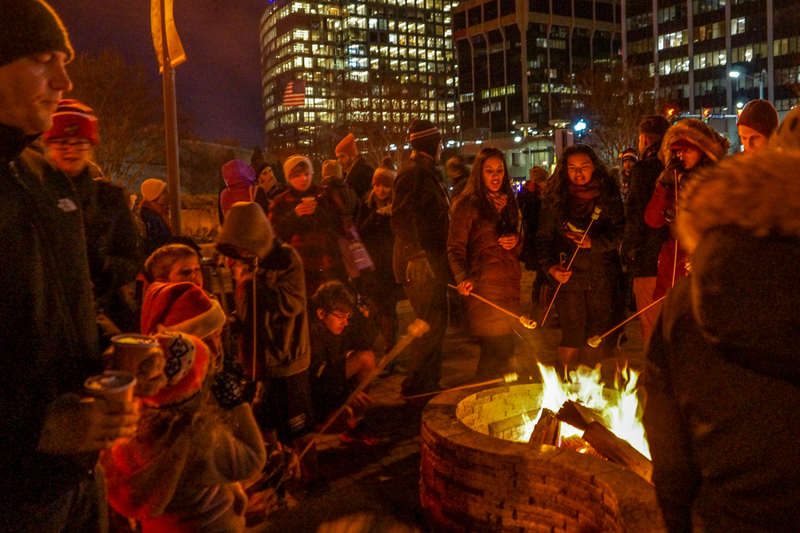 Teens, young families, couples and groups of friends congregate around the fire's warm glow to roast marshmallows and enjoy hot drinks. Lyndell Core, the senior Arlington Parks staff person who keeps the fire burning, says he sees the bonfire as something celebratory and unifying "as people gather to build a new tradition." 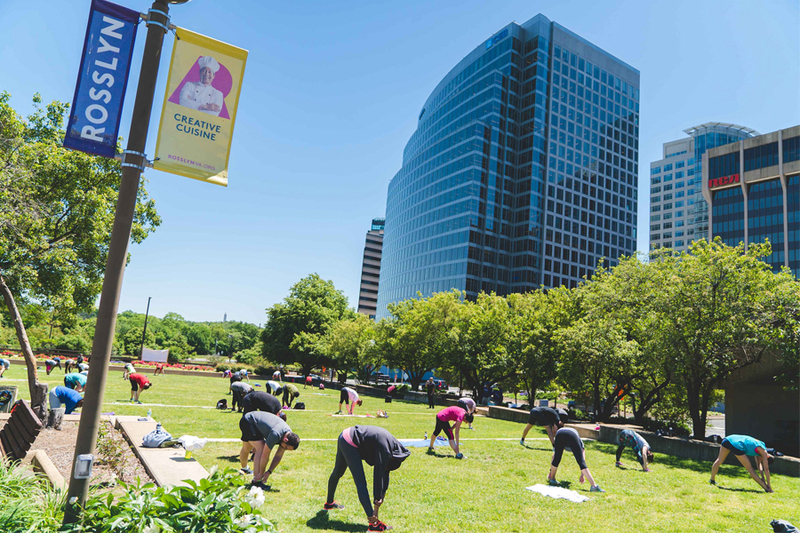 To meet the needs of Rosslyn's active urban community, the BID hosts a number of low-cost outdoor fitness classes during most months of the year. Bootcamp is among the longest running and most popular. Three times a week in all kinds of weather, dedicated enlistees sweat their way through an intense workout as Gateway Park is transformed into an open-air gym. On the ground floor of a residential building, the Bennett Park Art Atrium is a beautifully designed space featuring works of public art and a spacious outdoor courtyard. Although open to the public year-round, it was little-known and under-used until the Rosslyn BID began hosting events there in late 2016. 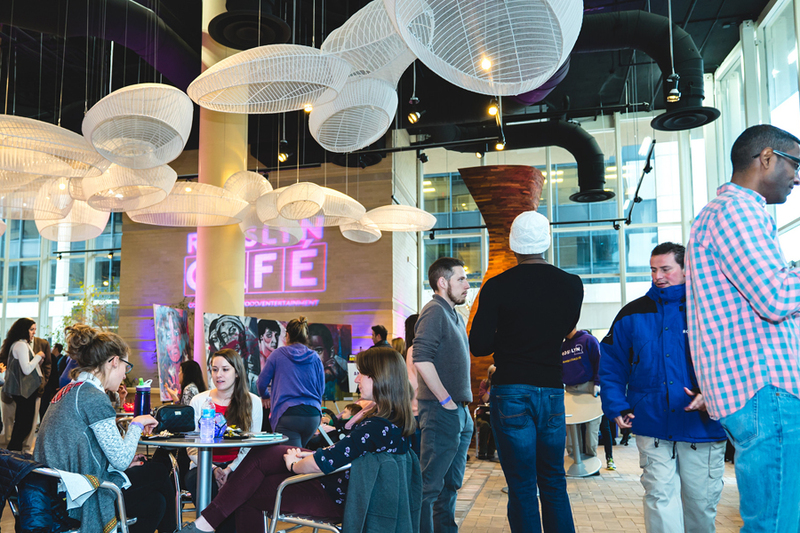 By spring 2017, it had become the site of the BID's April Arts & Beats, a weekly community gathering offering a live D.J., small bites from local restaurants, a cash bar, and the chance to mingle with local artists and purchase some of their works on display. 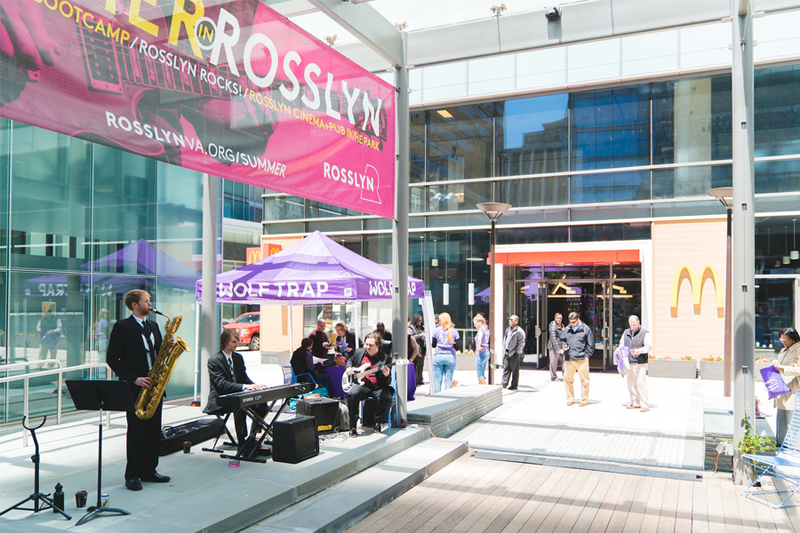 In the spring of 2017, the Rosslyn BID brought live music to Central Place Plaza during the lunch hour. Talented musicians from Wolf Trap, a renowned performing arts center in the D.C. area, played live jazz and other tunes while residents and workers sat outside to relax and enjoy. The live music helped introduce people to the newly opened public space and generated activity and interest after an extended period of construction. It said: The Plaza is open for business! 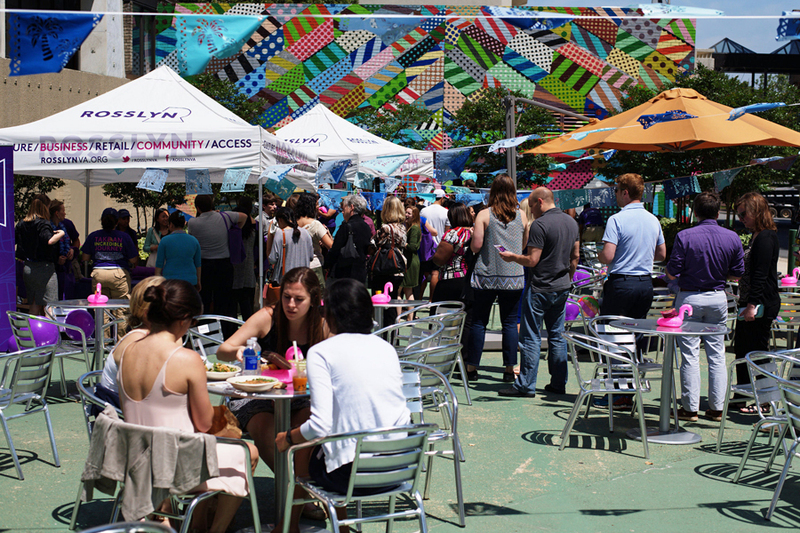 Soon after the Plaza on 19th was completed, the Rosslyn BID hosted Lunch at the Beach on a warm summer afternoon. Workers, residents and other visitors listened to live music as they lined up for free ice cream sandwiches. Everyone enjoyed the chance to sit outside and relax on a beautiful day. The BID gave away beach towels and used the opportunity to share information about upcoming summer events. It was exciting to see the new, formerly empty Plaza abuzz with people. Photo at top: The Plaza on 19th, which will soon become the site of Continental Beer Garden, has seen many successful pop-up events in its three-year existence in Rosslyn, including the Oktoberfest beer garden pictured here. Pop-ups offer urban planners lower risk, lower cost ways to experiment with different means of bringing unique retail and social experiences to their streets.